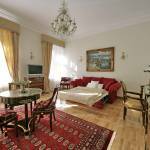 "The Suite facilities and location were great"
The St. George Residence Hotel opened its doors in April 2007 in the Royal Castle District of Buda as the first luxury apartment hotel in Budapest. 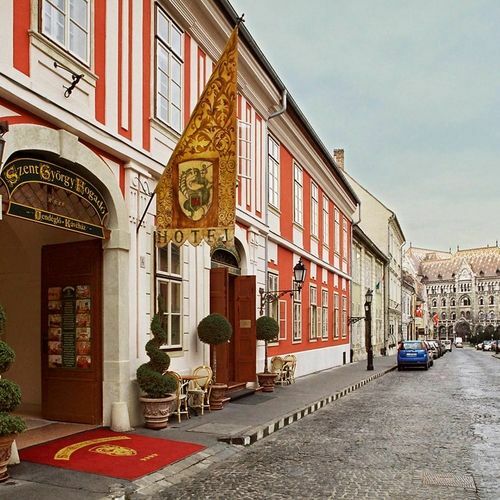 A 14th century building houses the hotel, which in the 18th century functioned as an Inn and had been the most famous place for an overnight and entertainment in the Buda Castle District. During the restoration and reconstruction of the historic building 26 suites, a cosy courtyard, a restaurant and café, banquet halls and a medieval wine cellar have been constructed. 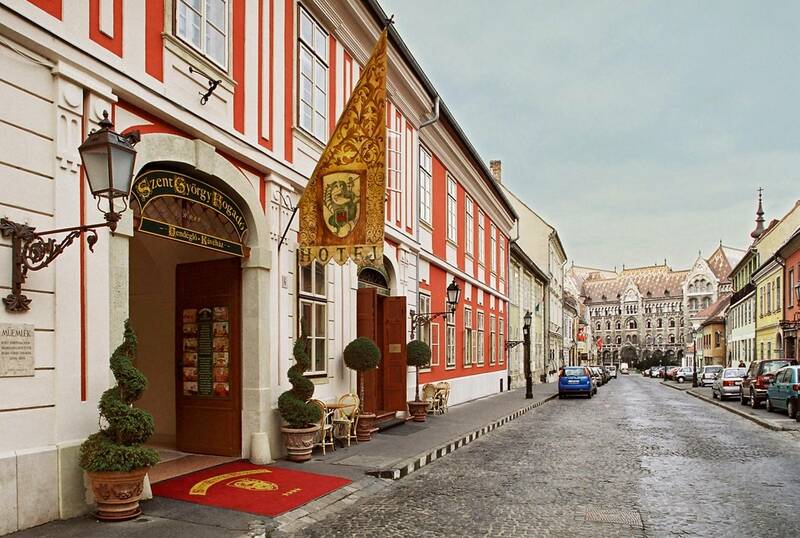 The St. George Residence Hotel stands on a UNESCO World Heritage Site called Budavár or the Royal Castle District of Buda. Towering above the city of Budapest, this site includes the Royal Palace, the historic Old Town and the Castle Hill boasting such attractions as the Fisherman's Bastion, Matthias Church, Holy Trinity Square and Presidential Palace. Within easy walking distance are the Museum of Military History and the National Archives of Hungary Throughout the area there are numerous shops, cafes and entertainment venues that will appeal to travellers of varied interests. The Castle District is regarded as the most representative and impressive part of historic and present day Budapest. Not all visitors know that below the surface another underground city is located beneath the Castle District the Labyrinth of Budavár. The Labyrinth itself is 12,000-metres long and consists of natural water-carved caverns, caves and underground cellars and wells. Both the Castle District and the Royal Palace host several museums and art collections including that of the Hungarian National Gallery which attracts thousands of visitors each year. The National Széchenyi Library and the Museum of History are located in the inner courtyard of the Royal Palace, where excavated architectural artefacts from the ruins of the Royal Palace and sculptures from the Anjou era are on public display. Throughout the year but especially in summertime the Castle Theatre offers a colourful repertoire of dance performances. The Royal Castle District of Buda also hosts festivals featuring handicraft and wine as well as unique cultural programmes. The spacious suites comprise of a living room, bedroom, bathroom (some of them with Jacuzzi), and an equipped kitchenette. They are luxuriously furnished with Empire or Chippendale furniture appropriate to needs of all age. The suites are available in 4 categories (bronze, silver, gold, diamond) and due to the historic nature of the building they are different even within the same category, which is why each of them has its unique ambience. Suite amenities are air conditioning, soundproof windows, bathroom with shower cabin or bath tub or jacuzzi), hairdryer, satellite TV, minibar, laptop size safe, telephone, room service, WiFi (complimentary), equipped kitchenette, study corner, hygiene and cosmetic set. The St. George Restaurant & Café recalls the atmosphere of Buda at the end of 18th century. The chefs of the restaurant are experts in preparation of recently popular dishes as well as dishes from the 18th century. The menu includes seasonal dishes and daily specials. 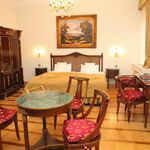 The rating of St George Hotel Budapest is 9.1 from the maximum 10, 21 based on actual and valid guest ratings and reviews. "1. We suggest comfortable chairs in your bar area. 2. The air conditioner in our room is very loud and noisy"
"Wir müssten erst darauf hinweisen, dass wir Halbpension gebucht hatten. Wir würden erst vor Ort informiert, dass das Restaurant am Heiligabend geschlossen ist. Das Frühstücksbuffet war nicht besonders"
"Freundliche Bedienung, viel Platz, Bademäntel im Zimmer (obwohl kein Spa), ruhig"